We mentioned the mystifying nature of DC's Flashpoint promos-to-date last week during The Source's weekly leadup to the May event helmed by Geoff Johns and Andy Kubert, but then something came along that made a lot of sense to me: action figures. 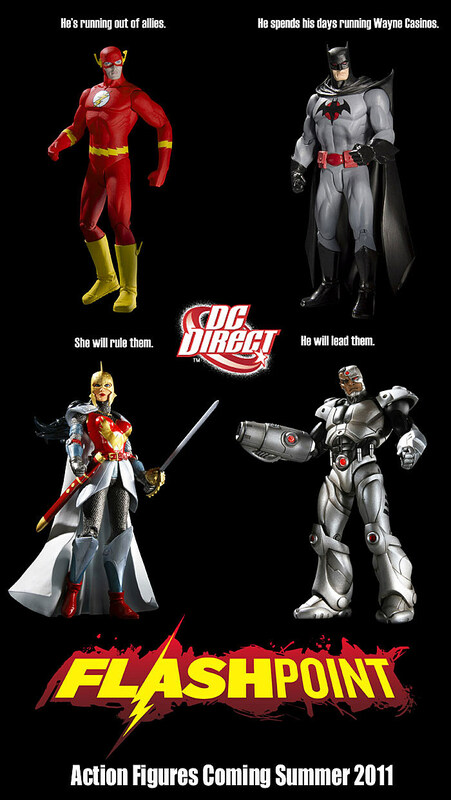 DC Direct's upcoming wave of Flashpoint toys may not explain the plot of the altered timeline story, but it certainly clears up the alternate likeness (and points of articulation) of the Flash, Batman, Wonder Woman and Cyborg will have when they're released this summer.Looking at these toys may not bring us any closer to understanding Flashpoint's particulars, but it's safe to say its banner taglines/questions/whathaveyou would have been a lot more arresting to toy collectors if they'd just started out this way. Make Cyborg strike a Mega Man pose and you've got my attention -- In a Flash!